Behold! They cometh with four and six cylinders, turbochargers and direct injection! Wielding monstrous power-to-weight ratios and fiendish specific output numbers! Inefficient, high-displacement engines flee in their wake, screaming in terror before the advancing army of forced-induction warriors! The big V8 is dying in a swirl of super-compressed and intercooled air. 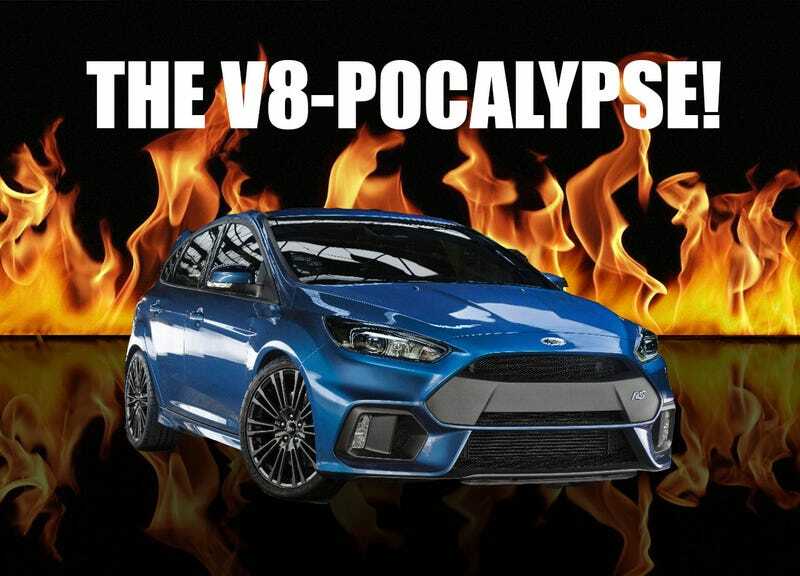 And Ford, one of the Grandaddies of the big V8, is heralding it's demise. Sure, they have the Coyote, but they've sent a very clear message with the GT, the turbo Mustang, and now the Focus RS. Turbos are in. Big-displacement V8s are out. It's the way of the world. (Kindly ignore Chrysler-Fiat's big, shoddily made hell-watevers that are essentially marketing ploys, but I'll get into that some other time). Are we sad? Do we weep at the big lunk's passing? Do we throw ourselves on his chrome coffin, sob chubby teardrops onto his cold, muscular chest? Not I. Surely I love V8s. I grew up freebasing fumes from carbureted GM small blocks, quivering in the wake of their growls. But I won't mourn their passing. Especially with the appearance of the engineering miracles that are the Ford EcoBoost engines and Tesla's magic, melon-sized powerhouses. Technology is good. Technology will deliver us.